[New York literati member Judith Regan, notably] is a BOOK EDITOR. i don't know who that is. i'm guessing she's some sort of book editor. ["Walker, Texas Ranger" star Chuck Norris, notably] is a BLACK BELT. [The Food Network's Rachel Ray, notably] is a CELEB CHEF. this entry doesn't feel quite as right without the -rity. [Watergate Era attack dog Chuck Colson, notably] is a HATCHET MAN. the name rings a bell, but i don't know much about him. and tying it all together, the central theme entry is [TV show whose name categorizes each of the people in this puzzle's four theme entries], or AMERICAN CHOPPER. i don't know this show. is it about two-wheeled mechanized conveyances? in any event, it wasn't hard to put it together. those four people all "chop," in different senses. chop text, karate chop, chop food, and, uh, chop political victims. chop chop. as you know, this puzzle was part of a crossword smackdown between matt gaffney and brendan emmett quigley. both constructors had to build a theme around an entry given to them by rex parker, and the answer to matt's contest was the common theme entry. 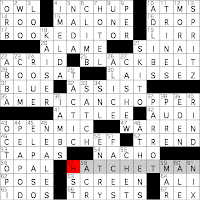 now, i actually knew the contest answer going in, because of a conversation i had with brendan on friday morning, but even if i hadn't it would have been abundantly clear from matt's title which of brendan's theme answers was going to be repeated in his puzzle: HATCHET MAN. in brendan's puzzle (which i blogged here on friday), "Superhero Rejects," he clued HATCHET MAN as [Antihero who keeps firing sidekicks?]. i thought that overall, brendan's theme was more amusing, and it had the added benefit of not including any people i'd never heard of or knew nothing about, or having as its "reveal" a TV show i'm unfamiliar with. so score one to brendan. not willing to let well enough alone, alex boisvert has created a forum for other constructors to get in on the act by creating their own puzzle built around HATCHET MAN. check it out. it's getting late and i don't have much to say about the fill. i do want to mention one clue i liked: [Creatures that can "high eight"] are OCTOPI. hee hee. anyway, i'll stop here. chime in with a comment if you want to declare a winner or suggest another HATCHET MAN theme.